Browse: Home / On The Road in Six Weeks! At last! I am making progress with Bertie’s restoration. Thanks to fellow MGCC members, Mike Parker and Dave Kato, the power train is back in and the windscreen is finally installed. 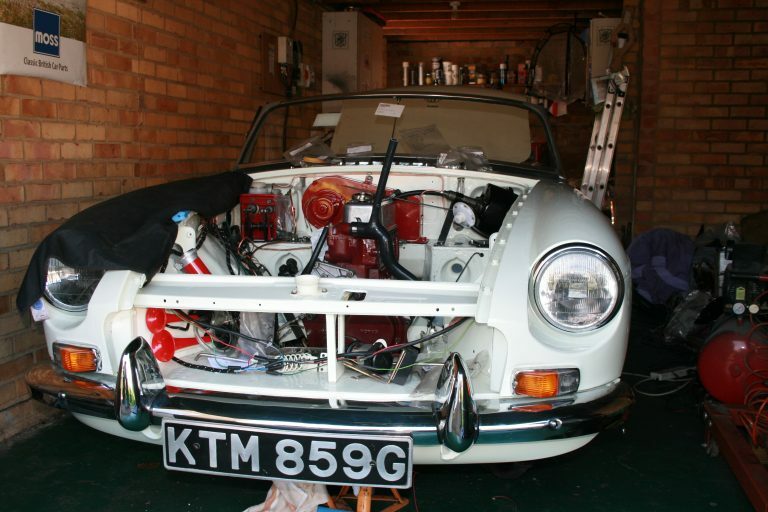 Initially I did not appreciate that installing the windscreen on the MGB Roadster is a two man operation. The design is identical to the MG Midget and I had replaced Bridget’s several times, but I wasted a whole week trying to install Bertie’s before several experienced people informed me that I would need help. With both of these tasks completed I can now get on installing the dash, connecting all the electrical items and installing the new interior. I can also start hanging all of the engine components back on the motor, such as the original HS4 carburettors, oil filter and electronic distributor. I have decided to replace the Weber carburettors with the HS4’s because I may need the facility to change the fuel mix ‘on the run’ and that cannot be done with Weber’s. I am at the early stage of planning another major run and will need the ability to change the fuel mixture during mountain ascents if the plans come to fruition. Fortunately I was given the HS4’s when I bought the car. They were in a cardboard box and I don’t think they have been used for ten years. They are now re-furbished and ready to go. The wheels have been delivered to MWS to be powder-coated and should be ready in three weeks time. I have ordered a new hood and matching tonneau cover. These should be with me at the end of May. I am hoping, therefore, to complete the rebuild in six weeks from now. Some more photo’s of progress below.